Not a toddler was behaving – Can I blame it on a full moon? Guess they are just blowing off steam. Tonight is our last night as land lubbers for a while! We head over to the peer early tomorrow afternoon! WE ARE SOO EXCITED! Caught up with the rest of the weary travelers as they are staying across the road in the Raddison. Much better hotel IMHO as they have free wi-fi. Although, Sheraton Fisherman’s Wharf does have epically cool fireplaces to sit around in the outdoor bar area. Today was fantastic, aside from not seeing our dear friend Sneep one last time, but it’s not such a big deal as we’ll hopefully see him when we are back through California in Jan. He’s a dear friend, and although he started out as mine, he’s as much (if not more) Grumpy Hobbit Hubbies mate too now. The kids (aside from Mr. Two-Year-Old) were much better today than yesterday. The Exploratorium is AMAZING and the kids and Steve had equal amounts of fun and were there until just before closing, and only left begrudgingly due to hunger and a desire to not get stuck in rush hour here in San Fran. Here is a shot of the kids playing upstairs. 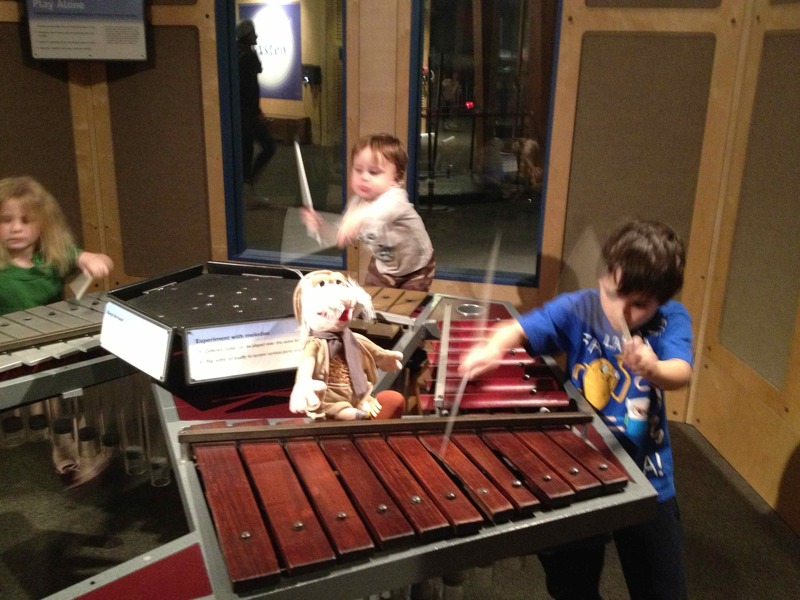 Seriously, if anyone is ever in San Francisco with their kids you MUST go to the exploratorium. It is a geeky parents dream come true! Seemed like a lot at the door when we were asked to pay $88.00USD for the whole family, but trust us, it was a full day of fun and well worth it! Apparently it will be re-locating so it must close for a couple of years soon, so get in quick! We’ll be checking it out as soon as it re-opens for sure! Might even be worth a special visit to the city by the bay to do so. I was going to write you all about one of the many times I was in San Fran and had the time to talk to some homeless people, and how harrowing and remarkable the stories were. All of the stories involved drug and alcohol dependency issues. All of the stories involved rock bottoms and last chances. Too many of the stories involved returned servicemen. There are some amazing, colourful, interesting, (and in a few cases mind bogglingly talented) human beings living on the streets here in one of the most beautiful cities in the world, and they all have a story. And one day I will relay some of the many I have been privy to. Not today though. The contrast between those stories and the pampered life I lead, and the adventure we are about to embark upon is a bit too great right now, and so I’ll save it for another time. We have had plenty of good news, like the port is just up the road, our rental return drop off point is less than a ten minute walk to the peer, the front desk is printing our documents for us and all in all… things are going eerily smoothly! Bestie’s girlfriend printed EVERYTHING and has a beautifully laid out travel folder with copies of copies and print outs of everything you can imagine. She’s kinda putting me to shame with her travel mojo actually. SO EXCITED TO BE HANGING OUT WITH HER! We are going to have a great time, and we’ll get to know our God Daughter O so well over the next month together. I can already tell she’s a tough little cookie and we’re going to get along just great. Well, better get going. I’ll leave you with two last pics as this may be the only time I have the bandwidth to post for a bit. One is of darling eldest son D at the Rainforest Cafe in Fisherman’s Wharf and the other is of middle child (and currently only daughter) SJ at the fine arts palace down in Golden Gate park. Hope you are all well! I’ll talk to you tomorrow I hope!